In collaboration with alien productions and ARGE Papageienschutz. metamusic aims to develop interactive sound installations and electronic instruments for animals held in captivity. The project’s target is to improve the animals’ quality of life, by designing an interactive musical environment that takes the specific needs and skills of the animals into consideration. 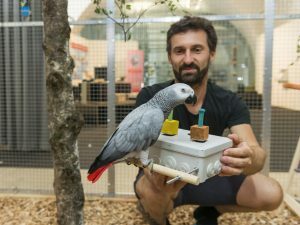 metamusic, initiated by the artists’ group alien productions in collaboration with the zoologists and animal keepers of the ARGE Papageienschutz, centers its attention on grey parrots. Parrots are intelligent, individualistic and communicative. With them we have been developing and modifying mechanical and electronic instruments which can be played by the birds themselves. Fine tuned sensors provide interactive modulation of sounds. The musical patterns and sonic structures generated by the parrots nevertheless are not meant to sound aesthetically meaningful to human ears. The parrots themselves communicate with each other by means of their own “music” created by their personal instruments. A major concern of the project is to avoid conditioning or training of the animals. The goal is to research whether or not the parrots will create meaningful “music” of their own accord —in order to find meanings and use in sound, which we have not discovered yet; and which maybe will change our understanding of animal intelligence—and music itself. In this further collaboration of the Tangible Music Lab and alien productions we aim to develop metamusic a step further: we will build electronic sound installations to be used by the animals themselves. What are the instruments’ design aspects to support the physiological and cognitive abilities of grey parrots? Can grey parrots generate meaningful musical and artistic output with such instruments? Can they develop musical skills and adopt an artistic role in a performance setting? What are the common design aspects and differences in musical interface design for animals and humans? How can we support parrot individuality and expressivity in the musical interaction design? Our zoological partners create the preconditions for our work, they take care of the parrots’ welfare and they are translators for animal behavior. But, unlike their science approach, our artistic interest aims at a creative exchange with this intelligent species. We make music together with parrots. We call it music even though it sounds “parrot-like”. We look at them as partners in a musical process.